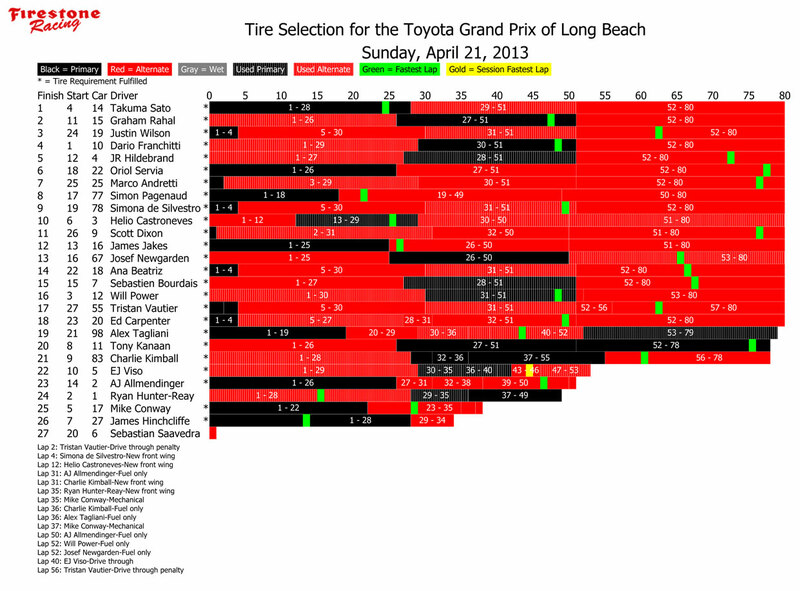 The Firestone primary and alternate tire specifications for Long Beach are the same as used in last month’s season opener at St. Petersburg, Fla. Firestone’s race tire development staff was successful at St. Pete in its goal to increase the performance gap between the tire specs, which made for crucial race-day tire strategies and an exciting conclusion. Firestone Racing expects similar tire performance this weekend. 19-Wilson held on pit lane due to a missing sticker on his rear wing; did not leave pits in time to post a lap time at speed. 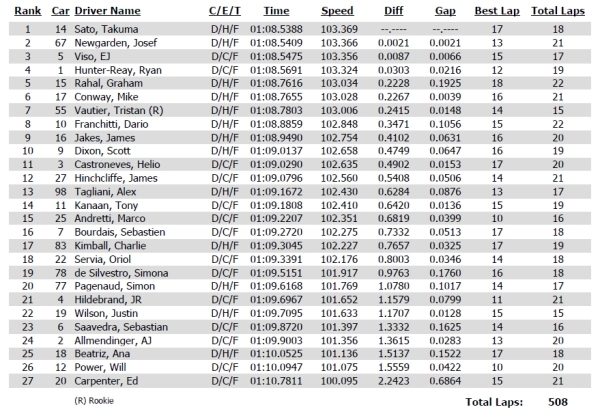 9-Dixon spins and blocks track in turn 1 with 1 minute left, 22-Servia drives into tire barrier to avoid contact with Dixon; red flag, segment ends early; no damage to Dixon, nose damage to Servia; Dixon penalized two fast laps. 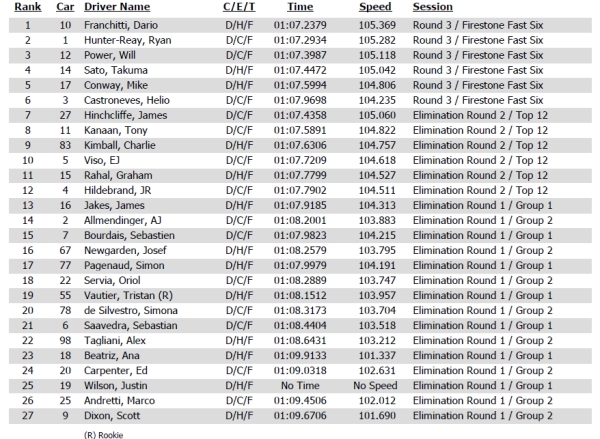 25-Andretti penalized for interference against 4-Hildebrand. Andretti docked two fast laps and as a result does not advance; Hildebrand then moves up to 6th position and advances. 28:00 left: 12-Power makes contact with the wall in turn 1; red flag, rear wing damage. 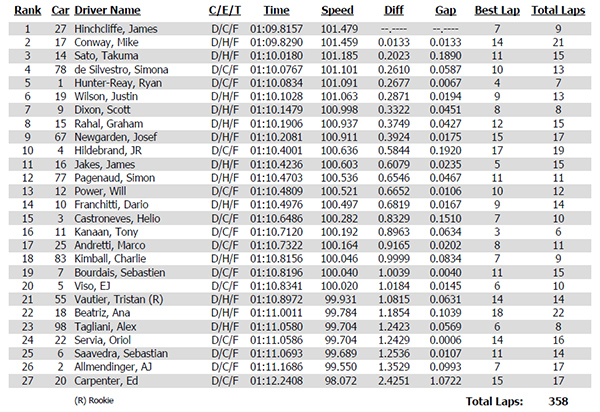 18:00 left: 3-Castroneves stalled in turn 5; red flag, no apparent damage; restarted and drove to pit lane. – 7-Saavedra made contact with the wall while attempting to exit a run-off; front end damage. 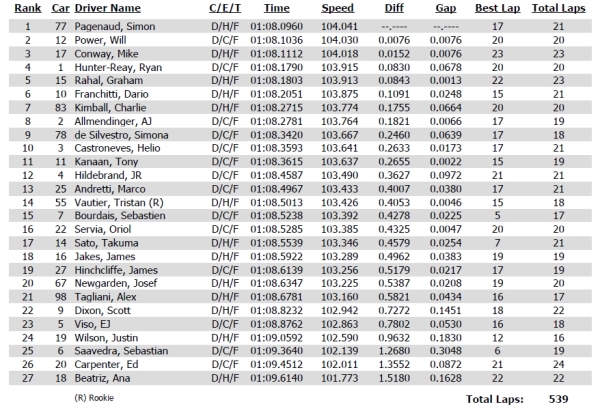 – 19-Wilson drove into the tires in turn 8 and was contacted by 78-de Silvestro; severe damage to both cars. – 9-Dixon made contact with the wall in turn 9; left rear damage. – 5-Viso made contact with the tires in turn 9; minor damage.